The first national guide to managing one of Australia’s worst weeds, silverleaf nightshade, has been developed with input from scientists, farmers, industry and community groups. NSW Department of Primary Industries (DPI) principal research scientist, Hanwen Wu, said the highly persistent summer-active perennial invades crops and pastures and has caused yield losses of up to 75 per cent in the eastern states. 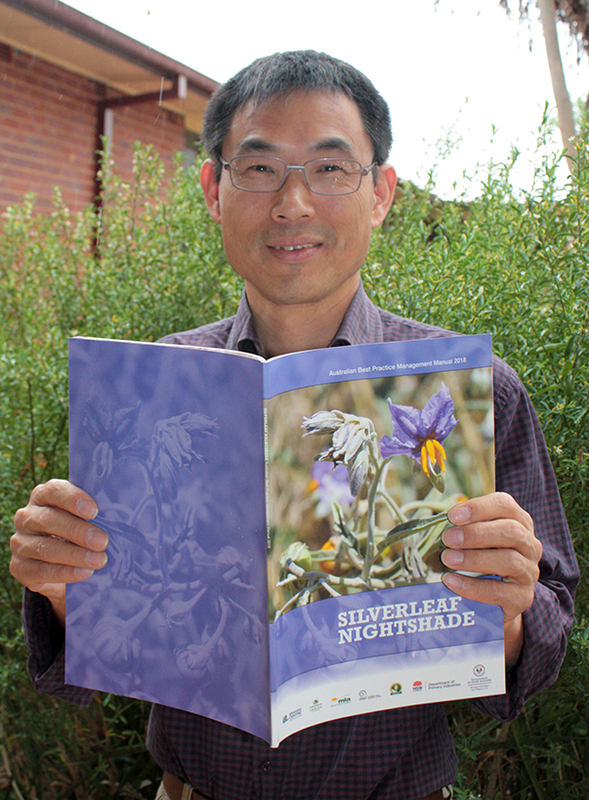 “The good news is silverleaf nightshade can be managed through timing and persistence in applying the controls,” Dr Wu said. “We have developed a dual action approach to weed management, which offers improved long-term control options to deliver economic benefits for farmers and environmental outcomes for the community. “The key element in managing silverleaf nightshade is to target both seeds and roots. “An equal emphasis is given to preventing seed set, reducing the seedbank and controlling the extensive root system, which is a major source of new growth. “Grazing, slashing or herbicides can help prevent up to 100 per cent seed set and must occur in late spring or early summer when plants are at early flowering, before green berries form. As part of the national project, Dr Wu and his team established more than 350 on-farm trials across Australia, covering a total area of 95,000 hectares with 150 trials in NSW, from Nullamanna in the far north of the state to Culcairn in the south. Silverleaf nightshade is a Weed of National Significance (WoNS), with widespread infestations in NSW, Victoria and South Australia, with localised infestations in Western Australia and Queensland. Download the new Silverleaf Nightshade: Australian best practice management manual 2018. A collaborative project between NSW DPI and Primary Industries and Regions South Australia (PIRSA). Produced with funding from NSW DPI, PIRSA, Meat & Livestock Australia, Australian Wool Innovation, South Australian Grains Industry Trust, the Australian Government and Victorian Department of Economic Development, Jobs, Transport and Resources, the best practice management guide was supported by Murrumbidgee Landcare and the Graham Centre for Agricultural Innovation, an alliance between NSW DPI and Charles Sturt University. For more information and additional images contact: bernadette.york@dpi.nsw.gov.au.